Our new coffee table attracted much attention. It featured re-claimed ivory inlay dots on a Macassar sunburst top. Just the fact that it was an elipse in shape added to the interest. 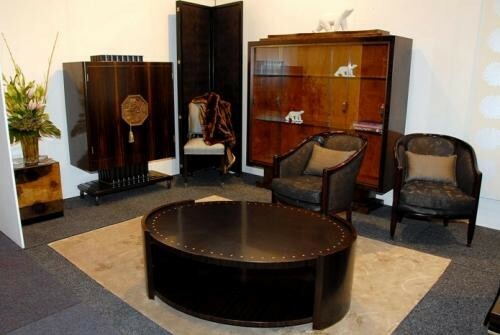 All our furniture is aged to give an appearance of old original furniture. This is not done with false distressing, but with using the fabulous materials of that period of the 1920's and 1930's. Careful attention to detail and years of studing that period make our furniture unique.